you might go to sleep! TO DOWNLOAD THE RINGTONE TO YOUR COMPUTER: RIGHT CLICK THE SONG TITLES BELOW, SELECT SAVE TARGET AS, CHOOSE THE FOLDER YOU WANT IT SAVED TO AND CLICK SAVE. Buddy Waters (McKinley Morganfield), raised in Clarksdale (MS), recorded this blues classic in 1953. This blues riff is from the song "My Babe", written by Willie Dixon and made famous by Albert King. 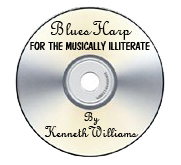 "My babe don't stand no cheatin'...."
Every harmonica player has his own version of the Railroad blues, but the best known is probably that one made way back in 1929 by blues harp player Freeman Stowers. Sonny Boy Williamson II (Rice Miller), one of the most influential bluesmen ever, first recorded in Jackson, MS in 1951. His magical harmonica accompanied his unique and captivating vocals. Another magnificent harmonica introduction by the great Sonny Boy Williamson, II, of his song "I can't Understand" on his "Keep It To Ourselves" C.D. One of songs in the blues-cult movie "Crossroads", from the mid-'80s. It's about a young guitar player in Chicago locating the great guitarist, Willie Brown, in a local nursing home. 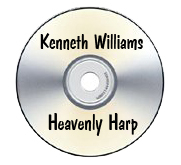 The harp was played by the great Frank Frost from Helena. He's one of only 2 people I've knowingly allowed to play one of my harps (other than grandchildren that were too fast for me). This is a typical opening harmonica riff made by an early bluesman. I can't identify what it opens for or who played it, but it's a great blues riff. The last part of the riff is a good demonstration of the technique of "tongue blocking". This is one of the world's greatest songs, not just Christian songs, but all songs. Known-and sung-by millions around the world. The only Broadway Musical featuring a musical opening by harmonica, "Big River" is a wonderful stage play written by the great Roger Miller. I've been blessed to have played the harmonica part twice for this fantastic play about the life of Tom Sawyer and Huck Finn. This is from the world's greatest country harmonica player, Charlie McCoy. It appeared on his "Nashville Hit Man" album in 1978. Charlie continues to dazzle audiences all over the world with his harmonica. This is rather a weak effort of replicating the fantastic opening on the '70's song by the group Super Tramp. The ONLY 8-track tape remaining in my musical collection contains this song. An American classic from the early 1800's, "The Wild Mizzoureye" reached it's greatest popularity aroung 1840. It continues to be a staple in American Music.